our own - and that makes all the difference. Now that you have purchased your BMW, you want a dealership that will treat it with the same care and dedication that you do at home. 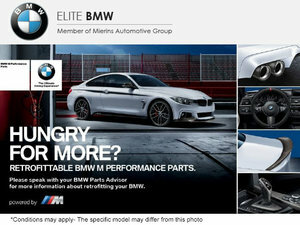 Look no further than Elite BMW, Ottawa's premier BMW dealer where a wide range of services are offered, including maintenance, service, repairs, Genuine Parts and Accessories, detailing, and access to a BMW-Certified Collision Repair Center. Elite BMW’s team of competent, certified technicians, service advisors, and parts experts are eager to help with all your service needs where the priority is your absolute satisfaction. To learn more about the services offered at Elite BMW or to book an appointment, call 1 844 267-4822 or use the online contact form.